Instructors may put items such as books, AV, readings, sample exams, or supplementary materials on reserve in the library to make them readily available to students. Reserve materials may be provided by the instructor or taken from the Libraries' collection. Please allow 3-5 days for processing. Reserve materials are subject to copyright regulations. For further information see the college copyright information page. Search Course Reserves in the Madison College library catalog by instructor or course. Truax campus instructors: Contact Erika Linzner, 608-246-6659; ELinzner@madisoncollege.edu or stop by the Truax Library Circulation Desk A3000. Downtown campus instructors: Contact Mark Luetkehoelter, 608-246-6638; MLuetkehoelt@madisoncollege.edu. Electronic reserves allow instructors to make supplemental course materials such as journal articles, lecture notes, web links, or sample exams available through the library web pages. Some electronic reserve links are available through the Course Reserves catalog. Not all library reserve materials are available electronically. Documents for electronic reserves may be in electronic or hardcopy format. 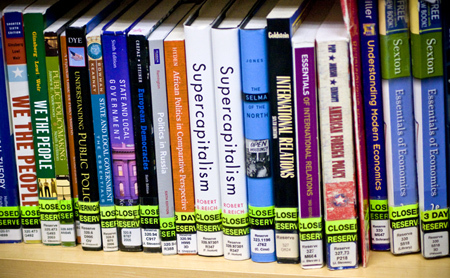 Electronic reserves may also include durable links to articles in library databases. Reserve materials are subject to copyright regulations. For further information see the college copyright information page. If you have questions about electronic reserves through the library catalog, contact Erika Linzner, 608-246-6659; ELinzner@madisoncollege.edu. To view video, click the above image.